Finding an appliance replacement bulb is easy using our guide below. 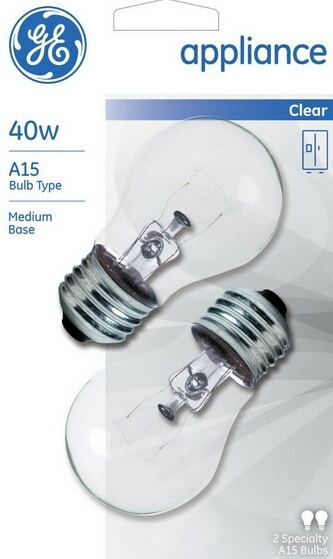 You will find a large variety of replacement appliance light bulbs for your brand and model of appliance. The most popular appliance replacement bulbs are for microwaves, range hoods, refrigerators, ovens, clothes dryers, stove top ranges, & exhaust fans. We will explain some details you need to know about appliance light bulbs to help you choose the correct replacement bulb and the most common bulbs that are replaced. PLEASE NOTE: The replacement bulb recommendations below are most common. However, the appliance light bulb you need will depend on what your actual appliance requires. Be sure the bulb you are buying matches the specifications for wattage, voltage, and size for the appliance bulb you are replacing. 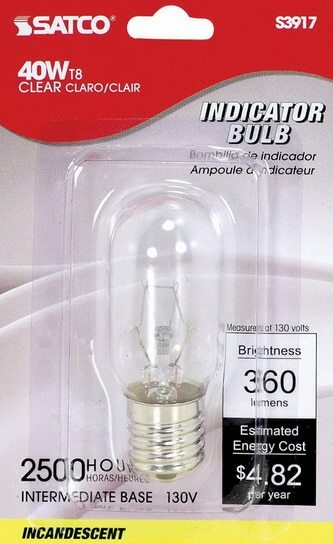 Most appliance light bulbs are 25 to 40w. 1. Light bulbs that go below the microwave (vent or night light) mounted above the oven or stove. The microwave replacement light bulbs below will fit on GE, Whirlpool, Kenmore Elite, Etc… They can be bought online or at Lowe’s or Home Depot. 2. Light bulbs that go in a typical refrigerator/freezer. 3. Light bulbs that go inside of an oven. 4. Light bulbs that go inside a microwave. 5. Light bulbs that go in a clothes dryer. NOTE: Microwaves are equipped with an internal light that turns on when the door is opened. Also when the microwave is operating. 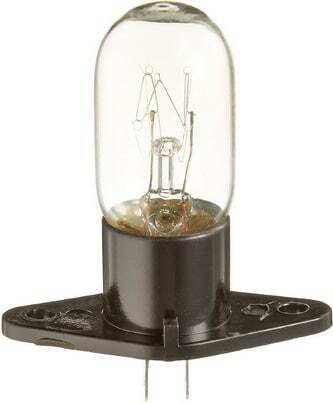 This bulb is usually a small halogen light or incandescent lamp. 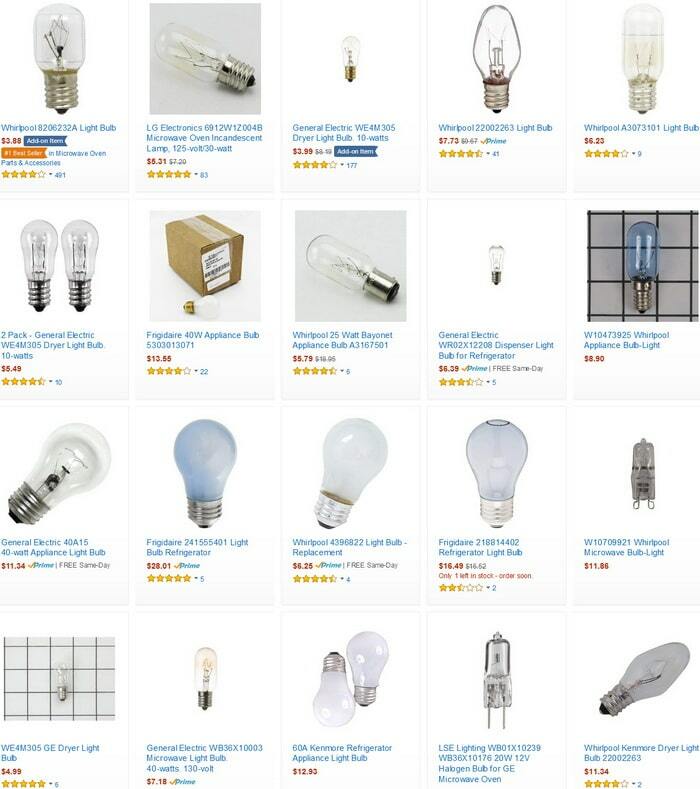 If the common appliance replacement bulbs above are not what you need for your appliance, have a look at the bulb picture below to find the exact appliance light bulb you need. MORE INFORMATION: Appliance bulbs have specifications for an exact fit, long life, and safety for the particular appliance. 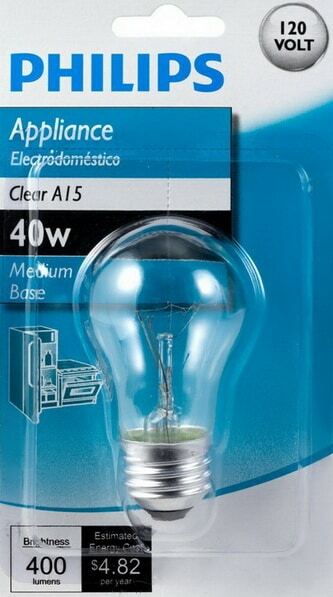 1 – Most microwaves, ovens and ranges use a screw base E26 bulb with the A15 glass shape. When replacing bulbs for these types of appliances you need to use a bulb rated for high heat. The type of bulb that is recommended for these types of appliances are halogen or incandescent bulbs. 2 – Exhaust fans and range hoods use a twist lock base. The twist and lock base is used where vibration is present such as a fan running. If you need other appliance light bulbs or need to find the correct light bulb in your microwave, oven, dryer, or refrigerator, please leave a question below and we will help you find the bulb you need for your appliance. The 40-watt A15 bulb in my Kenmore oven/range has almost no room around its cavity and cannot be gripped on its sides with my fingers. Do you have a tool that will grip that size bulb where it is located so it can be safely removed. Suction cup? Other? How that placement could have been designed that way is beyond me. Also, is it true that a brass-base bulb is better so it will not fuse with the socket? I did not have a light bulb when I moved in, so I have nothing to compare it to. Any help is appreciated. I replaced a dead 10 watt dryer light bulb with a new 6 watt bulb. The light will not go on? You may have a bad bulb, bad wiring in the dryer to the light bulb socket or the dryer needs a 10 watt appliance bulb.